MIT students wrote on posters on campus after learning the results of the presidential election. After an election like this, what are your hopes? What are your fears? That’s the question 20-year-old Caroline Mak and her friends asked the MIT community Wednesday morning. The college junior said she was watching the election Tuesday night with MIT Democrats, when she realized they needed a way to express themselves after such an emotional campaign. Mak and her friends originally invited students Tuesday night to have a gathering in the lobby to share their feelings. 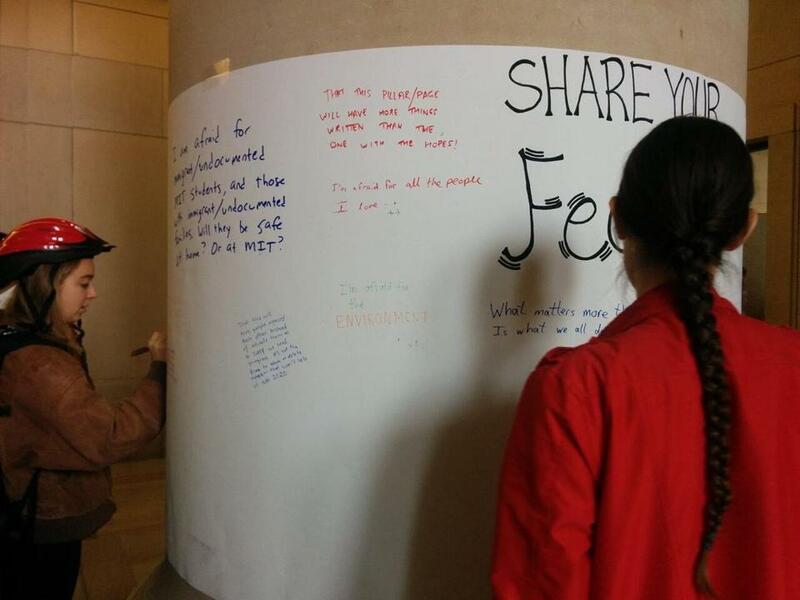 On Wednesday morning, however, the group decided instead to post giant pieces of paper on the lobby pillars and invited peoplel to stop by and write their hopes and fears. “All of us were doubtful if people would put anything there, but within moments it was getting covered,” Mak said. Mak said though she is a part of MIT Democrats, the posters quickly became an outlet for people from both parties. Mak said the posters, which caught the attention of school administrators, will likely be left up for several days. “I heard they might even be put in the MIT archives,” Mak said. Mak said she wanted everyone, regardless of political affiliations, to feel supported.